How can rose supports help? Rambling and climbing roses will only thrive in the wild with some form of support. Ramblers tend to grow up trees, while climbing roses often cover up other shrubs. If you try this in your garden, however, sooner or later these natural supports (perhaps an old apple tree for the rambler, or your neighbour’s taxus for the climbing rose) will be choked to death by the rose. Many of the most attractive new varieties, especially David Austin’s English Roses, tend to have large and heavy blooms that will hang downwards or even break off unless given support. In addition, the number of blooms which a rose will have depends to a large degree on how it is tied and grown. The maximum number of blooms can only be achieved if the rose is made to grow horizontally, at a slight angle, along an appropriate support. Varieties such as the standard or weeping standard rose, which are not found in nature, require special support from the very beginning. Which support for which rose? To find whether and, if so, which kind of support your roses require, take a closer look at what you have in your garden. 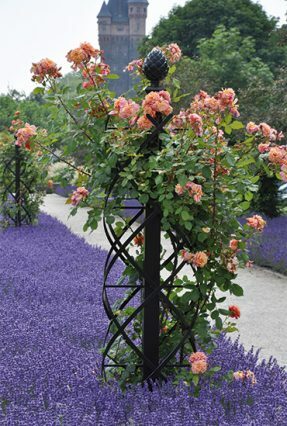 Border roses seldom require support as they do not grow to a great height. Low support frames may prove useful as edging if the pathway between rose beds is very narrow. Shrub roses, which grow to a height of between 5 and 6 ft., can easily grow to at least 7 ft. if trained on a support frame. They will also bloom more abundantly than in their natural shrub form. Obelisks, columns, free-standing frames and pyramids are ideal for this purpose. Climbing roses, which grow to a height of between 7 and 13 ft., will need some form of support. The classic solution is to train them on arches. Other options include the obelisks, columns, free-standing trellises and pyramids mentioned in the section on shrub roses. And of course, fences and walls are also suitable. 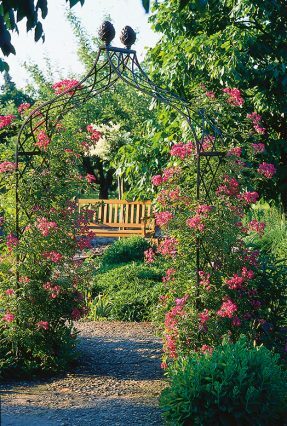 Rambling roses, which grow to a natural height of between 15 and 30 ft., are ideal for covering arbours, pavilions, pergolas, arcades and high fences or walls. Subject to certain limits, they can also be trained to grow on very large arches. Which supports should I choose? There is a wide range of support frames available on the market in every price category, manufactured from a variety of different materials. At the lower end of the price range, frames tend to be made either of wood or of thin, ungalvanised iron. At the top end of the range, support frames are generally made of solid, hot-dip galvanised, powder-coated steel. Even wood which has been well impregnated tends to weather after a few years, especially when it is densely covered with roses, and can only dry very slowly after a rain shower. This makes it necessary to impregnate the frame again using highly toxic substances – hardly a practical option for a frame covered with roses. It takes little more than a light breeze to make these climbing aids sway, even before the rose grows to cover them. Assembled from numerous small components, they lack inner stability. Since they do not undergo hot-dip galvanising, rust tends to form within a year and quickly eats its way through the structure which, to save on costs, is kept as thin as possible. Once these supports have been covered by a rose, their wind resistance can increase by up to a factor of 20, which will mean that they have a good chance of collapsing in the next autumn storm, taking down the rose with them. Made from 1.5 cm steel profile tubing and steel band (or stronger, depending on size), these supports are completely welded and then hot-dip galvanised. The welding joints, which are most susceptible to rust, are thus well coated. As even zinc will weather over time, the frames are also powder coated. Such is the ideal rose support. Our support frames, in addition to possessing these qualities, are also attractively designed. Even when bare, in winter or before plants grow on them, they are an eye-catcher and a true garden ornament. Rose breeders who recommend – and use – them include Peter Beales, Kordes, Noack and Tantau. How should I plant my roses on a support? Gardeners are sometimes unsure about how best to plant a rose at a support frame and train it to grow along it. The answer to this question is not always straightforward and will often depend on how you want to design your garden. The following guidelines apply for all kinds of support frames, including obelisks, arches or wall trellises. For ramblers, no special training is necessary – they can grow as they wish. Roses should never be planted in the middle of the column, even though this is often seen. This makes it difficult to train a rose and, sooner or later (usually after 4 years at most), spreading rose shoots will make the column lift slightly and lean to one side. Roses should always be planted outside the column about 7 to 11 inches away from it. To achieve a luxuriant effect from the very beginning, we recommend three roses per column, or four to six roses per arch – that is two to three roses at each side, depending on the arch’s size and location. It is a matter of individual taste whether you plant three different roses or three of the same type at an obelisk. In gardens under three-quarters of an acre (probably the majority), we tend to plant just one type, as different hybrids at a single obelisk can easily produce an unsettled effect. The same applies to arches and house walls. Restricting your choice to one type, which can be planted in greater numbers, will help to create an effect of expansive luxuriance. 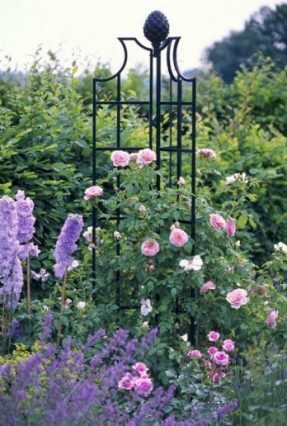 Shrub and climbing roses should be trained with care over the support frame. Always avoid allowing the soft stems to grow upwards vertically. Instead you should train them to grow horizontally at a slight angle. The rose will return the favour with rich blooms. Climbers will sometimes shoot up quickly, leaving them bare lower down – a less than pleasant sight. You can avoid this by training them as just described. When the stems are still soft, attach them from the outside rather than training them through the latticework, using bast fibre or some other soft material which will not cut into the stem. Within a few years, the stems will grow as strong as small tree branches. If trained through the latticework, they will eat into it, easily lifting the frame, especially if it is not solidly anchored. It quite easy to train shrub roses, climbers and –subject to certain limitations – ramblers to grow on the walls of a house, preferably east or west-facing walls. 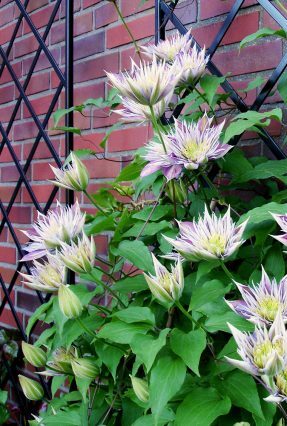 To do this you will need a stable trellis, positioned about 4 inches from the wall to allow air to circulate freely behind it. This is essential to avoid damp, which can damage both the wall and the rose. To facilitate subsequent painting work, the trellis such be mounted in such a way that it can be removed easily without damage to the wall. This text may be reproduced or reprinted only with express written permission.